The astrologer A.T. Mann will present a look at the year 2019 in the form of and as an extension in advance of his bimonthly new and full moon astrology newsletters. The principles remain the same: instead of doing “Sun Sign” astrology as you see in newspapers and online, we will be looking at the planetary influences of the coming year for everyone and learning how to put such universal influences into the context of your life as shown in your birth chart. To do so, we will look at the influence of the four elements, and also the nature of longer-range outer planet influences that last weeks, months or even years. And, together with lunations and inner personal planet events, we can. have an accurate picture of our view of the cosmos. Bring your charts and be prepared to listen and learn to know what questions to ask. The act of learning about and working with these issues is far more valuable than hearing someone tell you about how Taurus or Cancer people see the world, because there are no such people — we are all a composite of ten planets in varying signs. For example, the watery, visionary and illusory planet Neptune spends about 15 years in each sign it passes through, and we are in the first third of its passage through the sign it rules, Pisces, which exaggerates many of its main qualities. 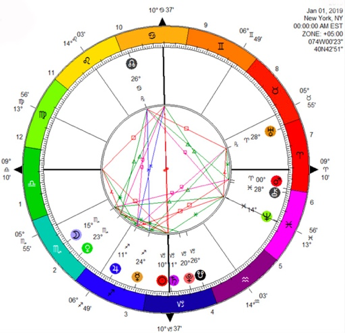 We all must deal with its influences, but in different ways as we have different charts, creating a range of very different relationships to Neptune, ranging from spiritual awakening and the deeper truths to downright illusion and lying. To know these ways will bring a greater clarity and more precise mindfulness to your life, starting with 2019. A. T. Mann is an architect, author, and astrologer. He has written or co-written 16 books (translated into many languages), including Sacred Landscapes (with Lynn Davis), Mandala Astrological Tarot, Sacred Architecture, Sacred Sexuality, and the 2011 Mandala Calendar. He has lived and lectured around the world. He recently curated and participated in “Astrology, Prophecy and Divination with A.T. Mann” at the Rubin Museum in New York and does astrology and tarot readings. He lives in Hudson, NY, and his website is atmann.net.